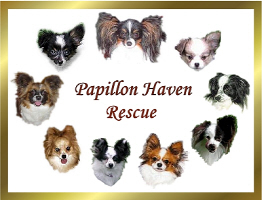 Copyright © 2014 Papillon Haven Rescue All Rights Reserved. Please contact us by email so that we can invoice you for the item and the correct international postage. All shipping listed on this site is for United States Domestic Only. At iGive.com, you can shop for everyday items in stores like Macy's Barnes & Noble, Eddie Bauer, Lands' End and QVC. It's FREE, there are no invisible costs or obligations, there are over 500 stores in the Mall at iGive.com, and up to 26% of each purchase made through iGive.com will be donated to Papillon Haven Rescue. Make a Difference in the Life of an Adoptable Dog! Thundershirts are helping shelters and rescue groups across the country to manage the dogs they receive with anxiety, fear and excitement issues. Your Thundershirt Donation will be put to excellent use helping to transition one of our wonderful dogs back to a forever home.